Hello, this is Hans Bluedorn. The last two books I wrote were called The Fallacy Detective and The Thinking Toolbox . They taught critical thinking skills to unsuspecting teenagers. 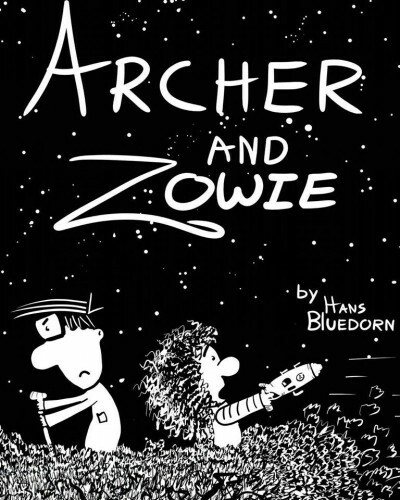 This is a small but feisty story about Archer and Zowie, two friends who build a spaceship and travel into deep space on purpose but crash land on an alien planet by accident and then get into a big argument about it. It is also about the mysterious Teleportee. A device so strange it can crumple up and chew on the entire universe in one googlebillionth of a second. In this book, Archer and Zowie will battle dark matter, babysitters, teleporting microwave ovens, big penguin aliens, and even the author of this book to come out on the other side…very dirty. You can purchase Archer and Zowie on Amazon for $6.99, but from August 28-September 1 you can download the ebook for free, plus receive a special offer. After you download Archer and Zowie and post your review on Amazon, email us at bluedorn@triviumpursuit.com and we’ll send you the art curriculum. Thank you for helping us get the word out about our new book Archer and Zowie. This entry was posted on Monday, August 27th, 2018 at 9:24 pm	and is filed under Children's Books, New Christian Logic Product. You can follow any responses to this entry through the RSS 2.0 feed. Both comments and pings are currently closed.